A 3D printer is slated to arrive at the International Space Station next year, where it will crank out the first parts ever manufactured off planet Earth. The company Made in Space is partnering with NASA's Marshall Space Flight Center on the 3D Printing in Zero G Experiment (or 3D Print for short), which aims to jump-start an off-planet manufacturing capability that could aid humanity's push out into the solar system. A company called Made in Space wants to use 3-D printers to make parts for spacecraft and space stations in orbit. In this photo, taken in February 2010, sunlight glints off the International Space Station, with the blue limb of Earth providing a dramatic backdrop. The 3D printer is slated to blast off in August 2014, tagging along with a cargo mission private spaceflight company SpaceX is launching to the orbiting lab for NASA. Advocates say 3D printing can help make living in space easier and cheaper. For example, more than 30 percent of the spare parts currently aboard the International Space Station can be manufactured by Made in Space's machine, company co-founder and chief technologist Jason Dunn told NASA chief Charles Bolden and congressman Mike Honda (D-Calif.) during a presentation today (May 24) at the agency's Ames Research Center in Moffett Field, Calif.
"3D printing is an exciting technology," Niki Werkheiser, 3D Print project manager at NASA Marshall’s Technology Development and Transfer Office, said in a statement. "It will allow us to live and work in space with the same efficiency and productivity that we do on Earth, with the ultimate objective being to eliminate reliance on materials and parts launched from the ground." While off-Earth manufacturing will get its start at the International Space Station, NASA officials say the technology's potential goes beyond low-Earth orbit. Werkheiser described 3D printing as "absolutely a critical enabler for NASA’s exploration missions." Indeed, NASA recently funded the development of a prototype 3D printer designed to make space food products out of cheap raw materials that have a long shelf life. This "3D pizza printer" could help feed astronauts on long space journeys, such as the 500-day trek to Mars, agency officials say. 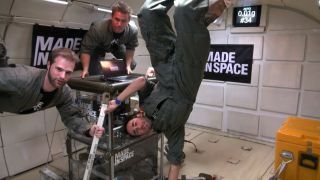 3D Print won't be Made in Space's first foray into microgravity printing. The company tested out various 3D printing technologies in 2011 on parabolic airplane flights that produced short periods of weightlessness. While 3D Print is primarily a demonstration mission, Made in Space is also developing a more permanent space-printing capability called the Additive Manufacturing Facility that's expected to arrive at the orbiting lab in 2016.